It's been a huge year for The Walt Disney Company. Before we ring in the New Year here on the Disney Post with new content and announcements, let’s take a look back at the major highlights of 2012. Growth was a key theme at Disney Destinations this year. With the launch of the Disney Fantasy last March, Disney Cruise Line has more than doubled our cruise business. Cars Land opened to rave reviews and completed the five-year expansion at Disney California Adventure, and Walt Disney World opened New Fantasyland and completed the largest expansion in the 41-year history of the Magic Kingdom. We also broke ground on Shanghai Disney Resort, making significant progress on our first Disney destination in mainland China. Disney Consumer Products delivers innovative product and retail experiences that leverage the magic of Disney brands and build franchises for long-term growth. In 2012, we continued to roll out our “Imagination Park” Disney Store format in premiere locations and enhanced the storytelling and product presentation on DisneyStore.com. Disney Baby, a brand we introduced in 2011 to reach new moms, expanded at major North American retailers and is now poised to enter select international markets. Following the success of Disney English in China, which now enrolls young learners in 44 English language learning centers across China, we launched a digital learning business to help parents everywhere instill a love of knowledge in their children. 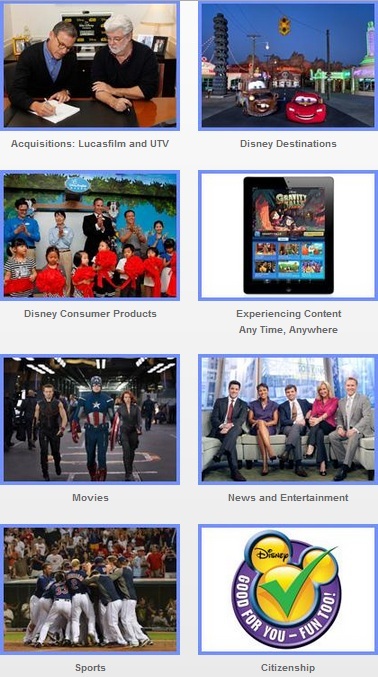 In order to deliver great Disney content to consumers anywhere and any time, we launched the new Disney.com, the digital gateway for all things Disney. We also expanded the reach of great storytelling from Disney, ABC and ESPN with a complete array of WATCH apps for all our brands in media networks. We also launched five #1 mobile game titles. Our Publishing team landed over 25 digital apps at the top of industry best seller lists, and Disney Interactive launched five #1 mobile game titles. Building on our Company’s animation legacy, a trio of outstanding films – Disney/Pixar’s Brave, Disney’s Frankenweenie, and Walt Disney Animation Studios’ Wreck-It Ralph – wowed fans across the board. In May, Marvel’s The Avengers, the first Marvel Studios film to be released by Disney, smashed global box office records, achieving the biggest U.S. opening of all time, and went on to become the year’s #1 hit and the #3 film of all time with more than $1.5 billion in box office receipts. Building on the movie’s success, Disney Interactive launched Marvel: Avengers Alliance, the first social game featuring Disney IP. The game has been critically acclaimed and played by millions worldwide. This year, The Walt Disney Company’s giving efforts totaled more than $292 million in cash, product and in-kind donations and more than 585,000 volunteer hours. We also expanded on our landmark nutrition guidelines established in 2006 and became the first major media company to introduce new standards for food advertising on programming targeting kids and families. This significant undertaking marks the latest step in Disney’s partnership with parents to make nutritious eating and physical activity more fun and appealing.